This guidebook describes 35 walking routes in France's beautiful Dordogne region, based around Sarlat and Souillac regions (Perigord Noir) and Bergerac (Perigord Poupre). The walks range from short walks to mountain circuits, and explore the spectacular gorges, chateaux and medieval villages of the region. 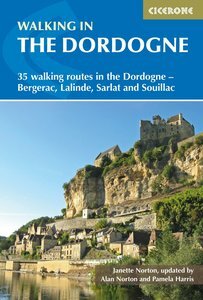 Guidebook to 35 half-day and day walks in France's beautiful Dordogne region, based around Bergerac, Lalinde, Sarlat and Souillac (Lot). The walks, which range from 6 to 18.5km, take in the region’s myriad delights, from spectacular gorges to enchanting chateaux and charming medieval villages. All walks are within the capacity of the average walker, and are on well-marked paths or quiet roads. They are graded easy or medium; there are no long, steep climbs or abrupt descents. There are step-by-step descriptions and maps for each route. Also included is information on the history, flora and fauna of the region, together with practical pointers such as what to take and when to go, as well as notes on waymarking, accommodation and transport. A route summary table and glossary are also provided. Lying in south west France, the Dordogne is a land of great scenic variety, from rolling wooded hills and fertile valleys to barren upland plateaus and limestone cliffs riddled with caves. The charm of the Dordogne also lies in the picturesque medieval towns, châteaux, churches and abbeys that stud the landscape, and these are the focus of many of the walks.